Cost: $20 – FREE Shipping! About this Virtual Run: Memorial Day is the national holiday to honor and remember Americans who have died while serving in the country’s armed forces. 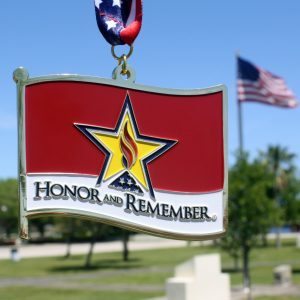 Participate in the Honor and Remember virtual 5k/10k/Half Marathon to show support for our fallen heroes and to help raise money for a charity that has established a tangible national symbol of gratitude (see below). All registrants will receive a custom electronic race bib and a beautiful 4″ Honor and Remember flag medal. Bibs are created instantly during the registration process, and medals will be shipped after participants upload their results or at the end of the virtual race period, whichever comes first. About the Charity: The mission of Honor and Remember is to perpetually recognize the sacrifice of America’s military fallen heroes and their families. The organization pays tribute to all military lives lost, not only while serving on active duty but also as a result of serving. Military deaths in all wars or conflicts and all branches of service from our nation’s inception are recognized. The primary vehicle for perpetual recognition is a specific and dedicated symbol of remembrance created by this organization: the Honor and Remember Flag, which is intended to fly continuously as a tangible and visible reminder to all Americans of the lives lost in defense of our national freedoms. A portion of the proceeds from this virtual race (at least $5 from each registration) will be donated to Honor and Remember. For more information about this charity or to make a direct contribution, please visit HonorAndRemember.org.